Fundraiser for Deserae Turner by Baylee Nikole Hardy : Fight for Deserae Turner! Deserae is going through a very hard battle! She didn't return home from school Thursday, February 16th and after many hours of not knowing where she was, she was deemed missing! After several more hours she was found near a canal by a family friend that was searching for her! She was seriously injured by causes that are yet to be determined. She was flown and is now at primary childrens fighting as hard as she can! Every little bit will help their poor family with their on going family expenses as they go through this tough battle! Please keep them in your prayers! You can also donate at any America First Credit Union to the Deserae Turner Fund! Thanks in advance for everyones prayers and support! Our sweet Des, forever changed, but thankfully not lost. Traumatic Brain Injury (TBI), Hemianopsia (1/2 vision) & Hemiplegia (left side weakness/paralysis) are some of your life long challenges now. When we think about all that has happened and all that is lost, All that is forever changed...Our hearts are heavy, our eyes dripping tears. However when we think about all of the wonderful people in this world who send their love and support our hearts are strengthened. We see that good can overcome evil. We can have joy in the little things again. To all that sent us love and support thank you! Your kindness means more to us than you will ever know! 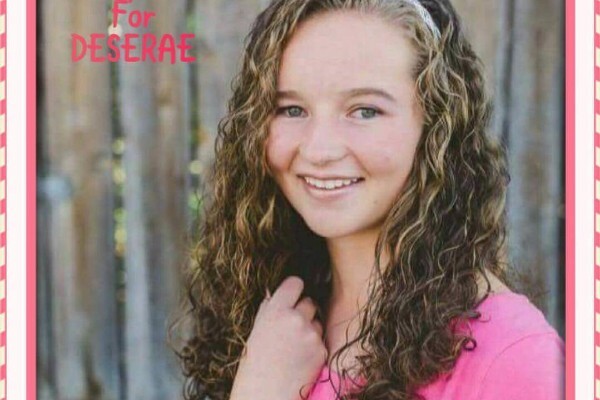 Through the blessings of our father in heaven Deserae is still with us and has made progress. We are so thankful for the hospital staff that have worked every minute of the last 19 days to keep Des alive and healing. Des is fighting so hard and we are grateful for the many small miracles along the way. Deserae has moved to the Neuro Trauma Unit. Her next steps include another surgery and extensive rehabilitation. Our sweet girl has been through so much as she battled for her life and this will be a battle she fights for a long time if not for the rest of her life. We are so grateful for all the support and prayers on Deserae's behalf. We would like to thank our community and people all over the world for their prayers, love and support. We ask that you please continue to pray for her, our family and the other families associated with this tragedy. We would like to express our sincere gratitude to family, friends, community members, and all of those we may not have met. The kindness our family has been shown is beyond measure. We are in awe of the number of people who have reached out to us, thought of us, and included our family in their prayers. Thank you! You Are Also Able To Donate At Any America First Credit Union!! Tell Them You'd Like To Contribute To The Deserae Turner Fund!! Thank You!! I am a clinical psychologist in Washington, DC. I feel for you and your sweet girl. Please feel free to contact me through facebook if there is any way that I can help the family in this difficult time. My thoughts are with you. I am sick about this. What kind of animals are those boys? What environment were they raised in? So sad. Stay brave and God speed Deserae. Praying for your family as well. No matter the fund it is the purpose. Deserae deserves a chance at a normal life again.We had been misinformed regarding go fund me fees. I ask that you view them before donating. Yes if you go through the bank they will get the full donation amount. After helping hand out filers, it was such a humbling experience. Hugs from strangers and well wishes to her and her family from all over the valley. We really do have an amazing community and that can be felt wherever you go. The willingness to help where people can, it helps restore your faith in humanity. No i may not know the family presonaly, but I am grateful for all that have tried . So a big THANK YOU to everyone. Praying for a full recovery. Praying for Deserae and her family! How is she doing? My thoughts are with you. This story upset me so bad, I keep checking the latest updates and this page and I'm so excited to see people donate. Just a side note about crime victims reparations. The offender usually has to pay at least a portion if not all of the money back to the fund as part of their sentencing, so yeah, make sure you use every available penny. I will be praying for her and the family!! Deserae! I've heard you are interested in equestrian! I really hope you are still involved in the sport and if you are, I'd love to make/ give you a Custom show jacket made just for you! You are such an inspiration and deserve to shine bright! Please contact me if you are interested! Contact the VA admintration hospital headquarters. I believe They've had an ongoing study in brain remapping after brain injury. They might be able to point you in the right direction. I would first like to say Deserae your story breaks my heart. I will be praying for a complete, complication free recovery for you. I also pray these two boys are tried as adults and punished to the fullest extent of the law. My daughter's 19 year old boyfriend had a major stroke 2/6/17 and has extensive rehab. long into his future as well. My daughter also has a brain tumor that was diagnosed at 6 yo that she was probably born with. She also had to go through multiple surgeries and months of extensive rehab. Childhood Brain tumors are lifelong battles but she's up for the challenge. Ironically her tumor and Zach's stroke are in the same part of the brain. You can do this Beautiful!! One day at a time, one hour at a time. Whatever it takes. I also want to clarify something others have commented on here. GOFUNDME DOES TAKE 7.9% of ALL donations plus $0.30. IF POSSIBLE PLEASE DONATE TO THE BANK LISTED SO Deserae and her family get the full amount. The donor is not charged to donate. GoFund me takes the 7.9% of the donated amount plus $0.30 per donation prior to giving the money to the family. For example if you donate $5, she will get $4.30. If you donate $25, she'll get $22.72. To see how this all adds up, at present $52,055 has been donated, 7.9% of that is $4,112.35. So far 1,106 people have donated so multiply that by $0.30 and you get $330.60. So far Gofundme will take $4,442.95, and the family will get $47,612.05. They've said above that donations can also be made at any AMERICA FIRST CREDIT UNION to the Deserae Turner fund and the family would receive the entire amount of your donation. May God bless you and your family. I might be out of line to say this but, for the love of God first and foremost, I hope you and your family have found it in your hearts to forgive these boys as far as you possibly can. Hard to believe something like this could happen in Smithfield. God bless you Deserae. Stay strong.